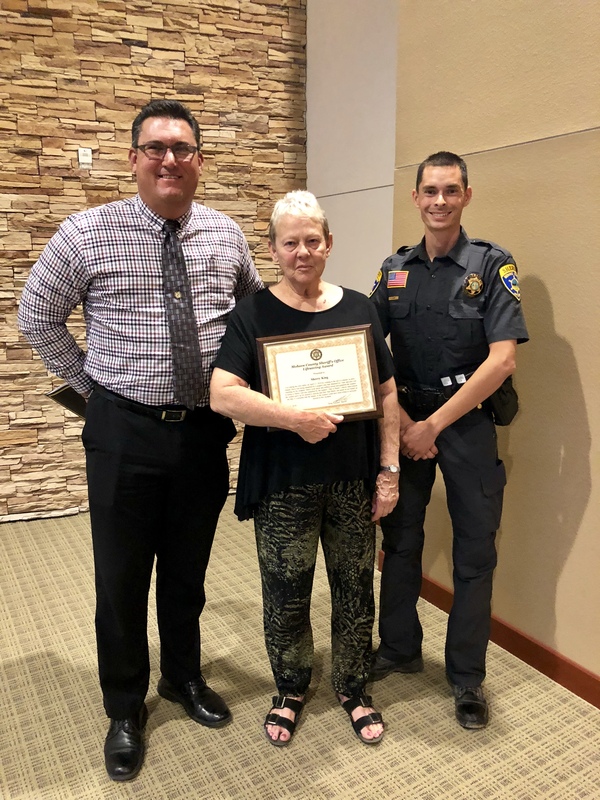 ST. GEORGE — “I saw a deputy was in trouble, and I just acted,” said 70-year-old Sherry King, the woman who courageously intervened in a potentially life-threatening struggle between an officer and a suspect in Beaver Dam, Arizona, earlier this year. King was presented with a “Lifesaving Award” by Mohave County Sheriff Doug Schuster in Kingman, Arizona, Monday for her role in helping stop a man who was allegedly trying to pull a gun from a deputy. The incident triggered a multiagency manhunt after the suspect, 34-year-old Darren Bruce Boone, fled the scene when King fired a warning shot into the air. “If he had got the deputy’s gun, there would be somebody dead,” King told St. George News. Mohave County Sheriff’s Office is crediting King with saving the life of deputy Jeff Davis. King recalled the morning of the incident, April 27, in an interview with St. George News. She was watering the plants outside her business, Little Dam Car Lot, when Boone pulled in to ask her when a nearby body shop would open. Moments later, Davis pulled into the lot and asked to see Boone’s driver’s license. When Boone became uncooperative, King said the deputy told him he was under arrest. After the deputy partially cuffed him, King said Boone pushed the deputy away and walked back toward his car. At that point, Davis attempted to deploy his Taser, but Boone allegedly grabbed it from him. King said Boone’s next move triggered her involvement in the struggle. “He reached around toward the deputy’s gun, and I just jumped him,” she said. 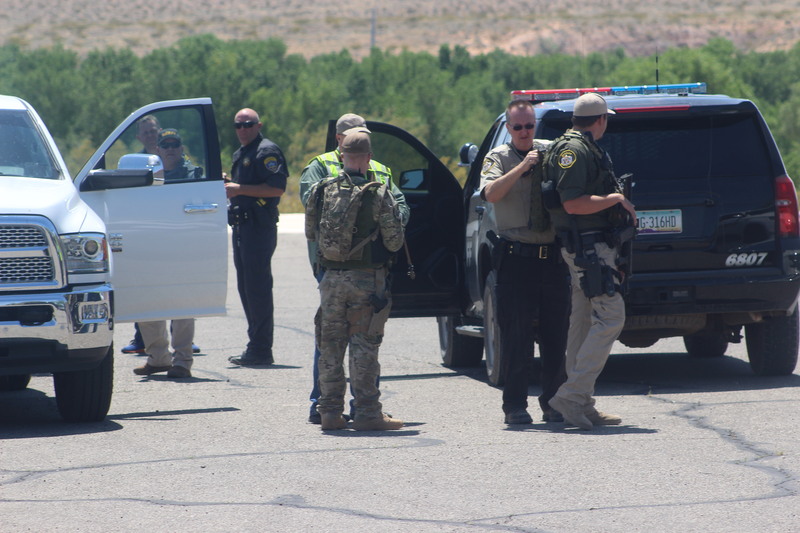 Boone then shoved her to the ground, King said, at which point she fired a warning shot into the air, which sent the suspect running toward a nearby wash.
Boone later turned himself in after a manhunt ensued for his capture. He was charged with aggravated assault on an officer and resisting arrest with physical force, both felonies. King has since spoken with Davis a few times since the incident. He joined her during Monday’s award ceremony, wherein she received a standing ovation from all present. While her ability to carry a firearm and use it came in handy that day, King said carrying a gun is not something to be taken lightly. “My dad was a cop. I grew up on a firing range,” she said, explaining that she was just 7 years old when her father started training her how to use a firearm. She’s had a concealed carry permit since she was 25 and still practices shooting in the desert near her home. King said she wouldn’t encourage someone to carry a gun unless they have experience, training and have completed gun safety courses. If the s–t goes down, I want to be with people like Sherry.